Deflects air out past rider and co-rider greatly reducing wind buffeting and mic noise. Great help in cold and wet weather by keeping the rider and co-rider much warmer and dryer. Easily adjusted to bring in more air if desired. 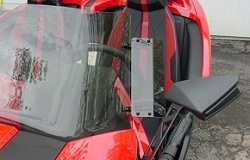 Clamps to the windshield requires no drilling. Deflectors available in scratch resistant plastics.